Volkswagen and Audi (Audi/Seat/Skoda/Jetta/Golf/Beetle/Touareg/GTI/ Passat and more) sold worldwide of 1990 or CAN Protocol cars. U281 is specially designed for car owners or DIY. 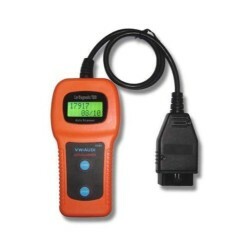 With a U281, you may quickly find out trouble causes (troubleshooter) of electronically controlled systems on your car, by simply connecting U281 with the diagnostic socket, via reading the trouble code (DTC) shown on U281, identifying, locating and checking out trouble causes with attached user’s manual. Easy-to-read crystal-clear backlit 2-line LCD display,Easy to use with one plug-in.